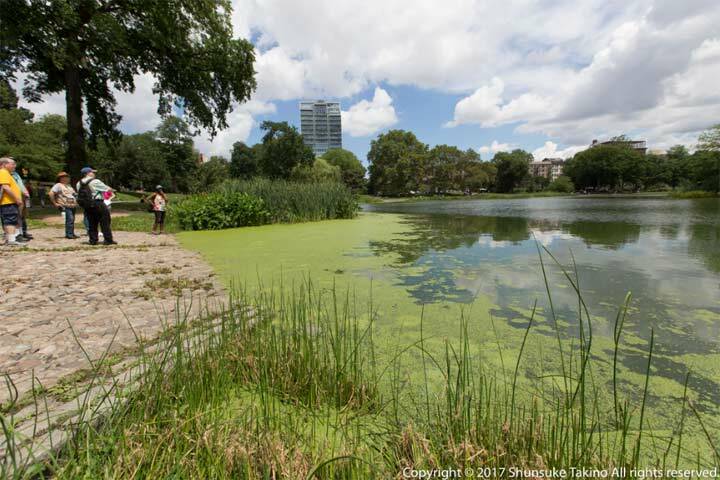 FNY had a brand new tour on July 10, 2016 concentrating on Northern Central Park, including Harlem Meer, seen above. It looks quite natural today but Harlem Meer, named for a Dutch word for “small sea” (dark patches on the moon resembling bodies of water are called “meres”) was engineered by park creators Fredericl Law Olmsted and Calvert Vaux to replace a tidal marsh fed by Montayne’s Rivulet, which was retained (we will see it in a few minutes). Today its water is piped in from the Central Park Reservoir and the pool reaches a depth of 4 to 8 feet. The occasion of a British attack so close to New York City during the War of 1812 galvanized New Yorkers into action. 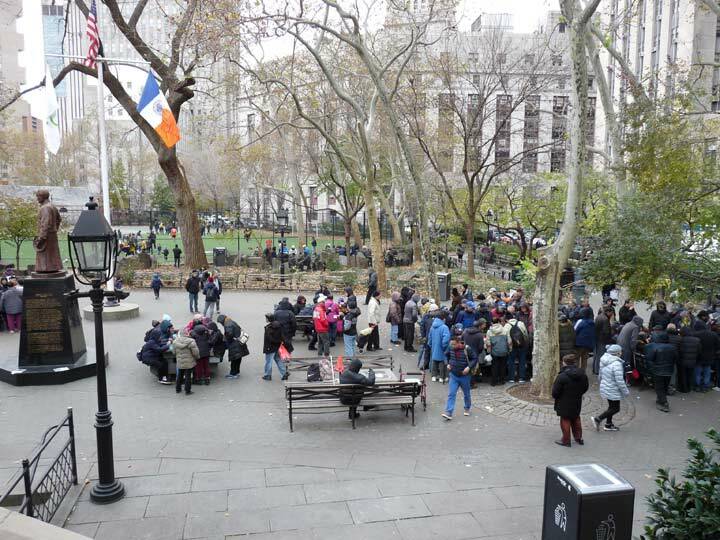 Within days of the naval battle, a call went out for fortifications to be built; firemen, lawyers, members of the Master Butchers Association, the Sons of Erin, Columbia College students and others began digging trenches and building forts along the high ground in Manhattan. A chain of major batteries was installed in upper Manhattan: Fort Clinton, Fort Fish, a battery at McGown’s Pass, Nutter’s Battery, and Blockhouse Number One were in what would later become Central Park. We saw the sites of all these fortifications on this tour. 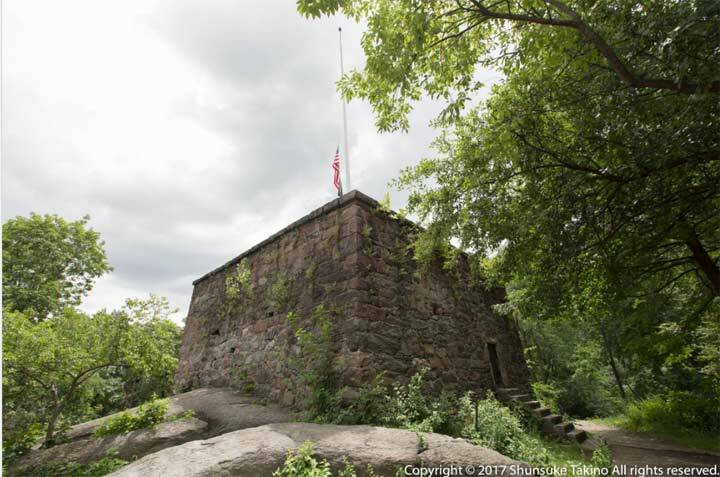 For many years, the Blockhouse was in ruins, and a plaque commemorating its history was stolen (as most of them are). In recent years, the Blockhouse was stabilized and its flagpole repainted. 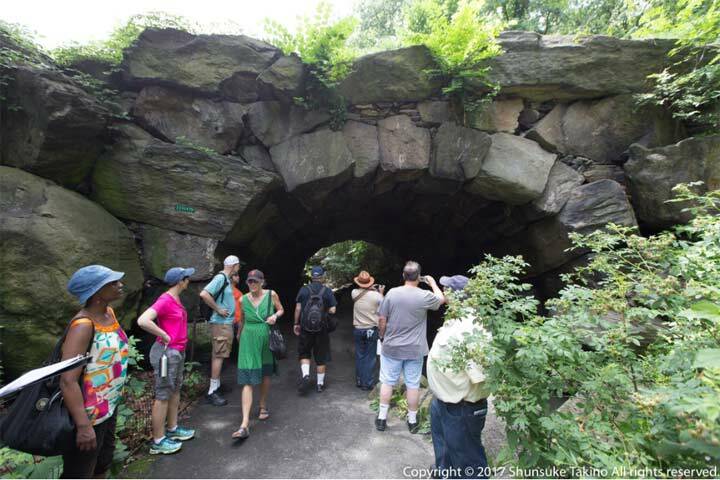 To many observers, Huddlestone is the most remarkable Arch in Central Park. From some angles, it resembles a natural cave. It rests on neither mortar nor metal supports and is made of immense natural boulders, some of which weigh up to 20 tons, or 40,000 pounds. It has withstood traffic from horses and buggies on up to the SUV era and carries the East Drive. It was constructed in 1866 by Vaux and Jacob Wrey Mould. 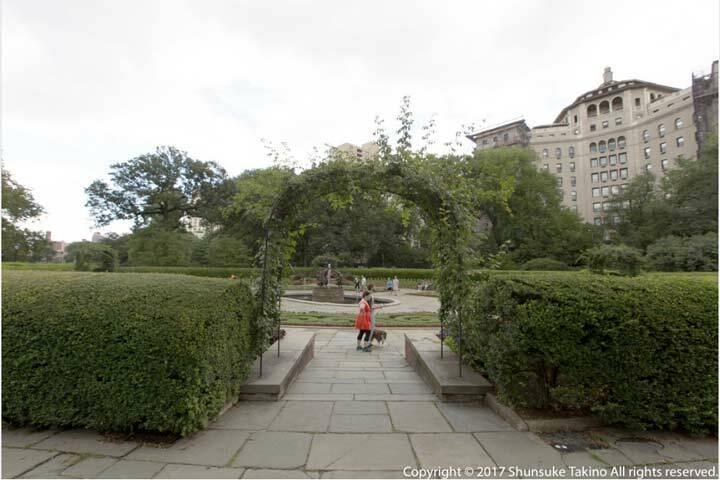 The Conservatory is the only formal garden in Central Park, featuring a distinctive lawn flanked by gardens and walkways arranged in concentric circles with carefully arranged plantings. In the spring thousands of tulips bloom here and in the fall, thousands of chrysanthemums.